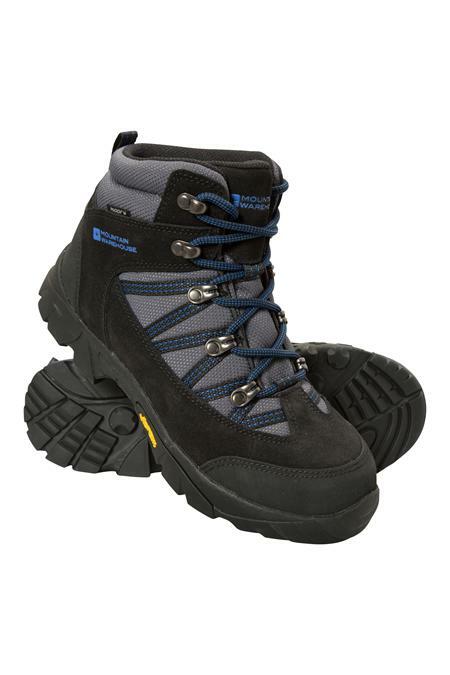 Walking boots are arguably the most important consideration when walking or hiking. The right walking boots and walking socks can mean the difference between an enjoyable walk and an uncomfortable, even dangerous one. You need to consider whether you’ll be walking in the hills, on uneven ground or on a flat surface, as this will affect the type of walking footwear you buy. If you’re going to be walking in the hills/mountains or on uneven ground a walking boot is recommended over a shoe. It will be very easy to twist your ankle on uneven ground and a walking boot will provide better ankle support than shoes. 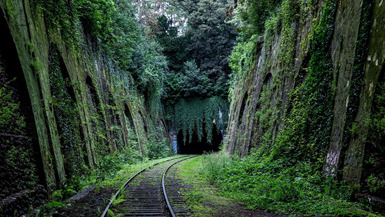 If you are walking on flat, even ground then you may prefer a walking shoe. Walking shoes or trainers can be less obtrusive on the ankle and provide more flexibility in the foot over boots. However, they will not provide the same levels of support and protection that boots can offer. 2. 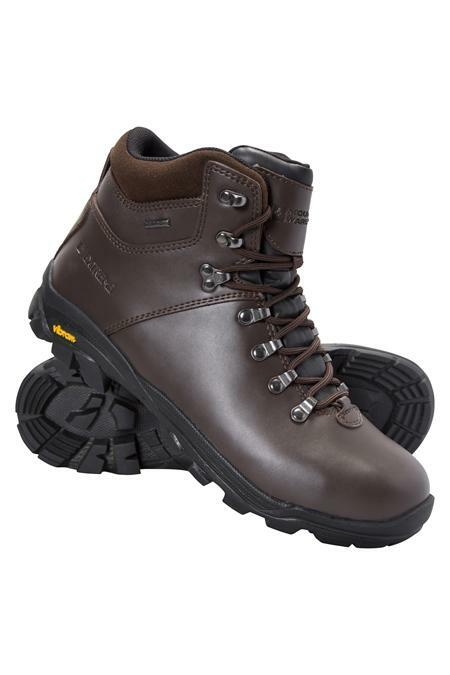 Leather Or Fabric Walking Boots? 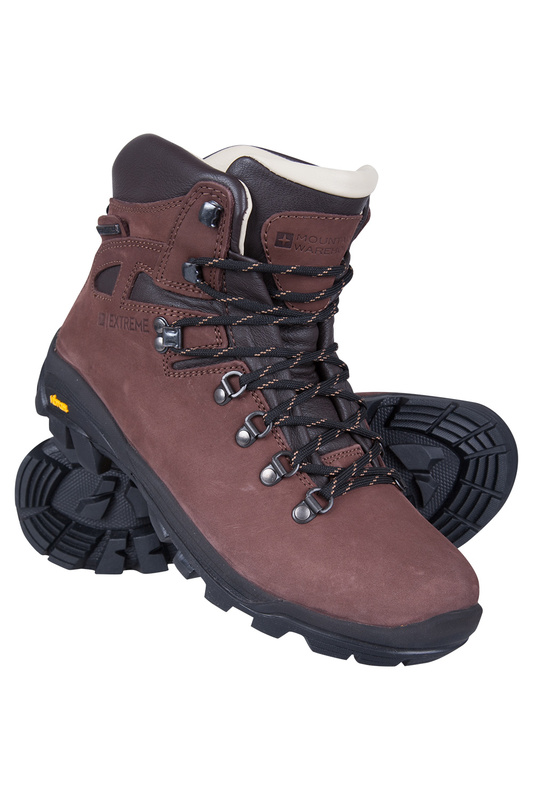 Walking boots can be made with suede, leather or fabric which will normally be mesh. Fabric boots are lighter and more breathable than traditional leather uppers. For many, the choice is often down to personal preference but here are some pointers to help you decide between the two. Virtually all outsoles on walking boots or shoes will be made of rubber or thermoplastic rubber (TPR). Vibram® is probably the most recognised brand of high performance soles on walking boots. Vibram soles are made from a mix of rubber, carbon and silicone and are stiffer and denser than other types of rubber. Vibram soled boots are renowned for providing exceptional grip thanks to the tread patterns designed for enhanced performance. The upper refers to everything on the outside of the shoe, above the midsole. The upper can be made from a variety of materials but the most common would be leather/suede or fabric, usually mesh. The insole is the inside part of the shoe and will sit underneath the foot, it’s also referred to as the footbed. Insoles are often removable and can be replaced to improve comfort and fit. Take a look at a range of different insoles in our footwear accessories. The midsole is a layer of material between the inner soles and outsoles. It provides support and is important for shock absorption and, along with the outsole, protects the wearer from sharp objects under foot. The tongue should be thick enough to protect the top of the foot from the pressure of the laces. Padded tongue and ankles provide comfort and support as well as providing impact cushioning for tackling tough terrains. There are generally two types of cut for a walking boot- mid and high. There is no such thing as a low cut walking boot, this would be a walking shoe. Mid cut boots, opposed to shoes, protect your ankles and offer support, ideal for shorter day walks. 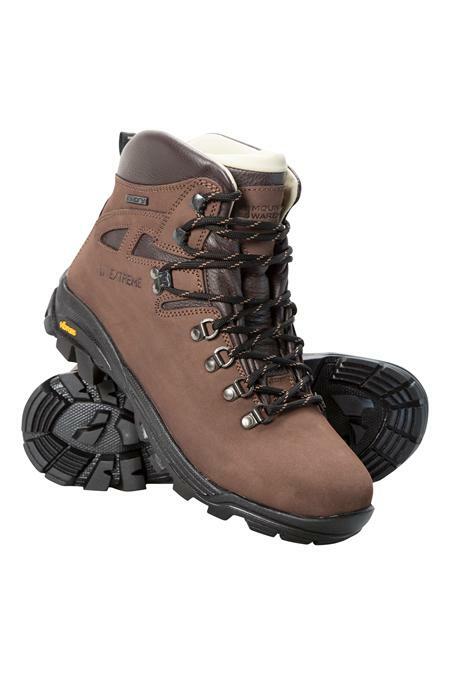 Higher cut boots offer more ankle support on rougher terrains but do not allow the same flexibility as a mid-cut boot. 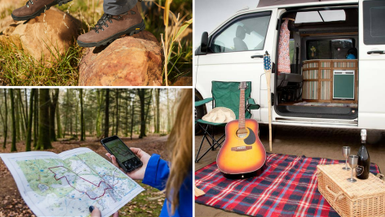 Now you know how to choose the best walking boots, why not use the links below to check out the Mountain Warehouse range.